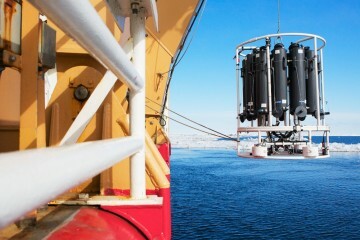 Scientists and coasts begin another ice deployment. You’d better hang on and tread carefully down the steep brow onto the ice. It’s cold, 12° F, on this Memorial Day. Back home sweaty citizens are slapping burgers in Riverside Park, sunbathing scantily clad on blankets, flipping Frisbees for their kids and dogs, but there are no holidays aboard research vessels; ship time is too expensive. Here, the sun is a warmthless, bone-white monocle peering through the slow scud of cloud. 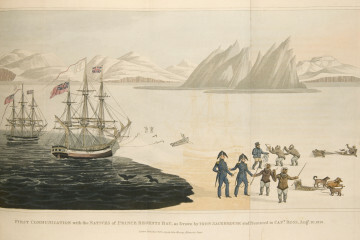 Scientists, their grad students, and Coast Guard volunteers lug generators, shovels, coils of extension cords, gas cans, drills, plastic coolers, water sampling jugs; they drag augurs and arcane apparatus in packs and hard cases on toboggans that Fridtjof Nansen might recognize from his trans-Greenland trek. Some of these people have drilled ice-core samples and measured myriad things in and below ice in the Arctic, Antarctica, and most everywhere else in the cryosphere. Others are walking for the first time on a frozen ocean, you can tell from the broad smiles and the delight in their eyes, even behind sunglasses, as they survey the scene. I know a little something about the behavior of oceans in their liquid state from physical oceanography expeditions in the western and eastern Arctic and the Indian Ocean. 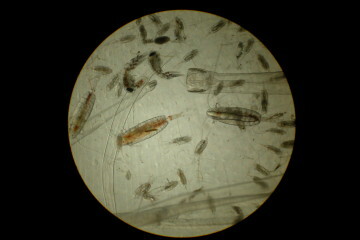 But plankton biology, biochemistry, sea-ice geophysics, spectroscopy, ice permeability—this is new stuff to me. And as the science teams pick their spots, assemble their gear with head-down concentration, it’s clear this isn’t the best time to practice inquisitive journalism. But we’ll take it slow, and I’ll pass on what I learn; these scientists are practiced explainers. For now, we’ll focus on the sample-collection stage, more labor than white-coat laboratory science. The test tubes, pipettes, filtration systems, microscopes—the analysis phase will come later, in several ship-board labs. Matt Mills saws an ice core for the algae at the bottom. Jason Christensen is aboard as liaison to the Inupiat whaling communities at Point Hope, Barrow, Point Lay, and Wainwright. Earlier in the cruise, when close aboard the Alaskan coast, he was talking with the whalers and our scientists to forestall overlap. 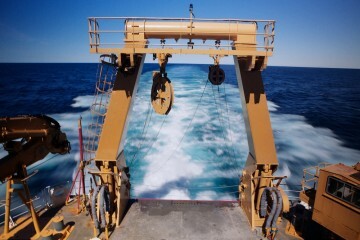 Now, well offshore, the issue no longer pertinent, Jason has become chief driller, manhandling a gas-powered augur to produce (many) 10-inch-diameter holes in the ice. 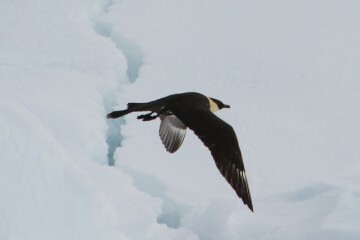 Broadly speaking, the thrust of the expedition is toward the life beneath the ice, so holes are requisite. Caroline Guilmette and Margaux Gourdal are lowering a dip net through Jason’s work to collect phytoplankton. There isn’t much to collect right now at this pre-bloom stage, while little light finds its way through the snow-covered ice to the seawater below, but that will change, and suddenly, in the days to come. Chief Scientist Kevin Arrigo, his Stanford grad students, and his wife Jan, a member of the outreach team, are also drilling, but their purpose isn’t to punch through to seawater. 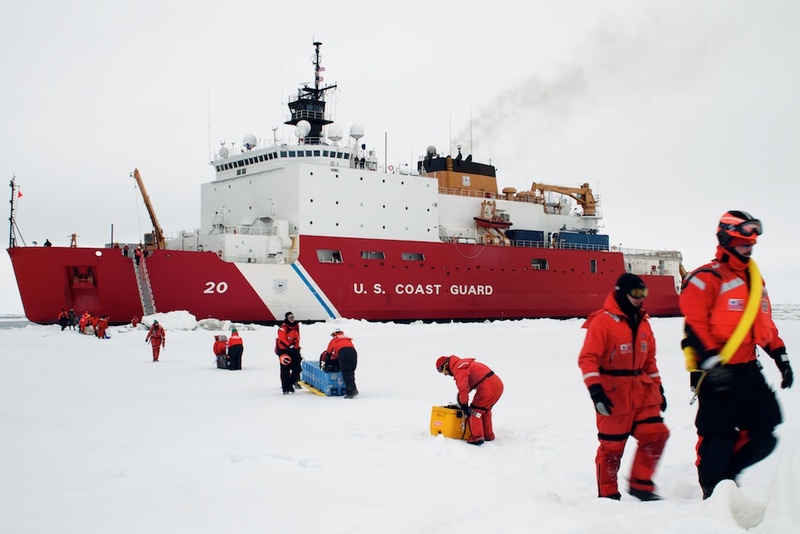 They’re extracting core samples of the ice itself for his research and for others who’ve stayed aboard. Some of our researchers are interested in the internal properties of the ice, but Kevin is mainly concerned with the very bottom where it meets the water and the brown algae grow. The ice is still hard; you’ve got to lean on the drill to induce the corer to cut. Do a couple of cores, and you’re no longer cold. 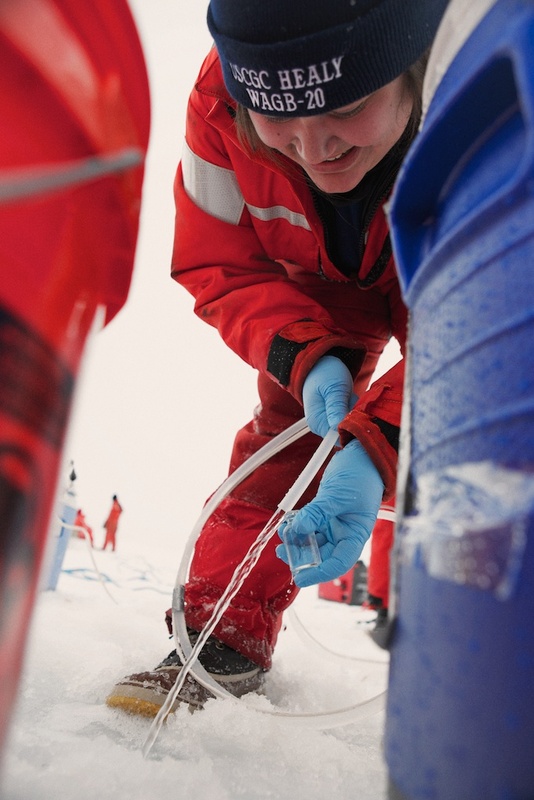 Margaux Gourdal takes seawater samples to measure gas composition. 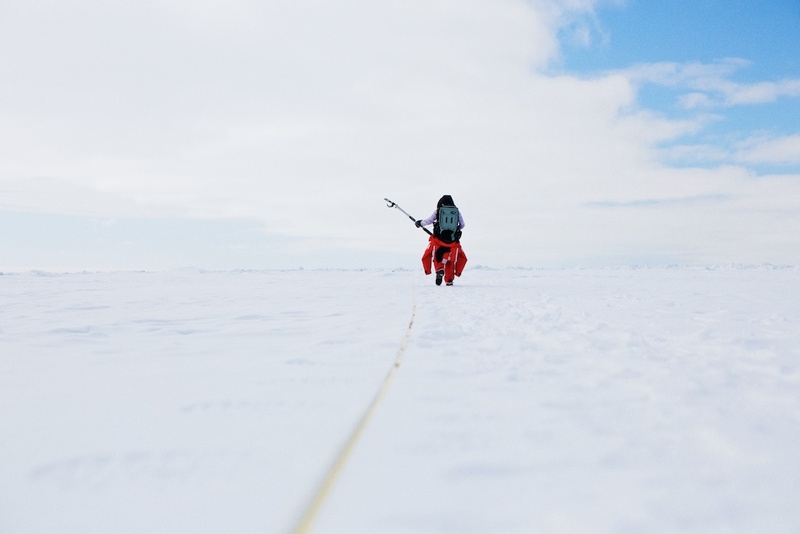 Off alone, Carolyn Stwertka, packing a spectroradiometer, is walking back and forth along a straight-line transect to measure the light reaching the ice and that reflecting from it. This, in general terms, is albedo. If the albedo is high, as now when most of the light is reflected back skyward, then the ice will remain intact; if low, as later when the snow disappears, the ice will melt quickly. But in this, the frequency of the light waves matter, but I’m not yet quite certain how. You get used to it, but this is an incongruous scene, when you stop to dig it: the great white-and-red vessel looming like an alien mothership recently landed, Jason’s gas motor chattering like a suburban lawnmower, all of us in our identical red Mustang suits kneeling over holes, sawing ice cores, taking notes, attending computer read-outs; we’re all aliens in polar-bear habitat. Caroline Stwertka uses a spectroradiometer to measure the ice albedo. 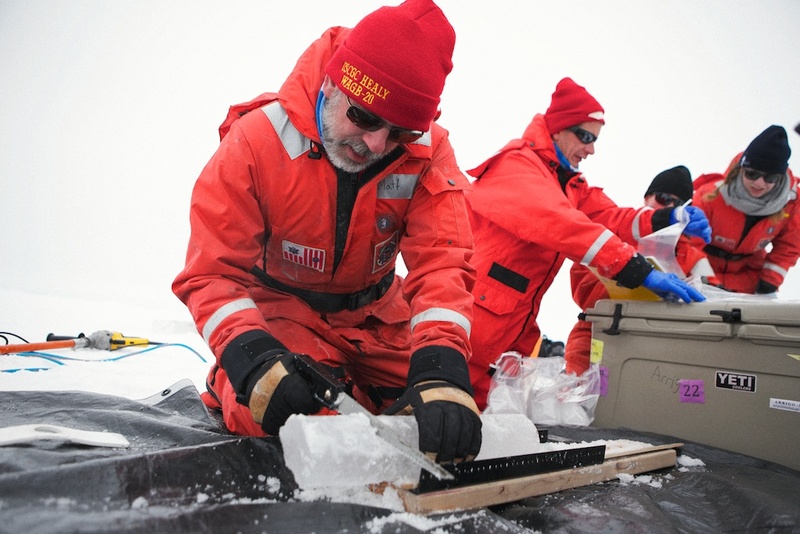 Mathematician Ken Golden and Chris Polashenski, ice-science leader, are also extracting cores. Ken and Chris have determined that the ice is a lot more permeable than it looks. Remember those freshwater melt ponds we talked about earlier? 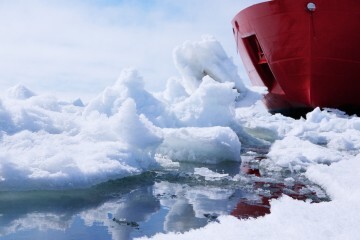 The onboard hypothesis holds that the ponds, acting as skylights, deliver light through the ice to prompt premature plankton blooms. Right now there are no ponds, but the question hangs: If the ice is so permeable, why do the melt ponds form at all? Why doesn’t the water just drain into the ice? Ken and Chris are thinking that it has to do with the difference in freezing temperature between fresh and saltwater. So Ken and Chris want to pour freshwater into one borehole, then saltwater into the other, see what happens. A Coastie has just delivered a box of (kosher) salt. “Kitchen-sink science,” Chris calls it. Okay, my feet are frigid, the rest sweaty from coring in too many layers of clothes. I think I’ll go back aboard the mothership, have a shower, and begin to try to put it all together. We’ll talk later. If you’re keen to see more, resident photographer Amanda has a gallery of images from the day. Take a look! 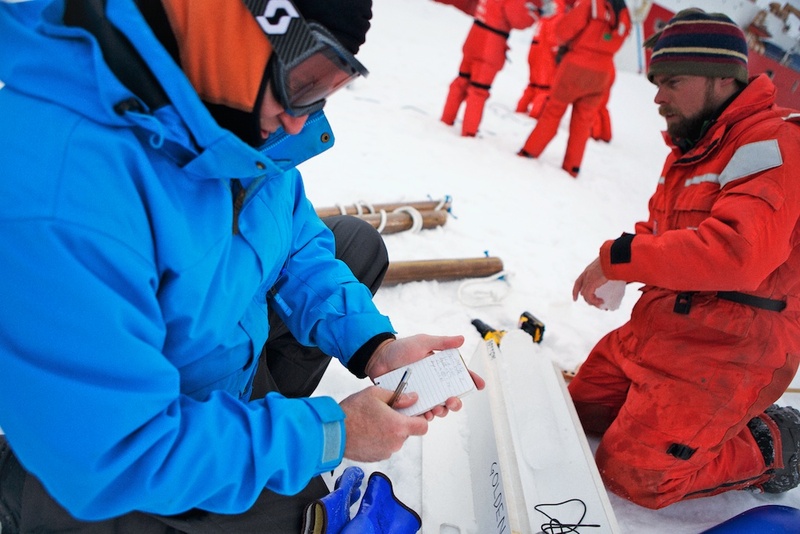 Ken Golden and Chris Polashenski measure the ice core temperature. Dallas is an author with nine published books, a mix of fiction and nonfiction, most recently "To the Denmark Strait", an account of a 2011 oceanographic expedition with Bob Pickart. 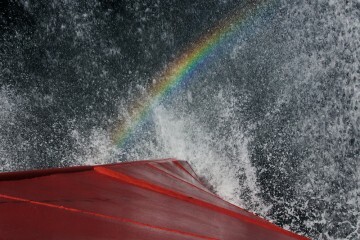 The Healy cruise will be his sixth Arctic expedition serving as outreach writer.